round up at the register! three to choose from… pocket change makes real change! 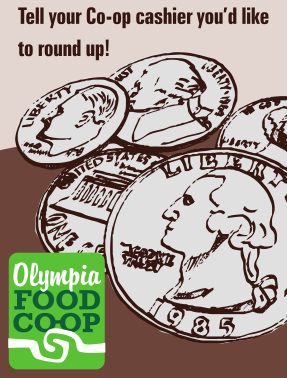 Rounding up at the register has been an tradition here at the Olympia Food Co-op for a long time. It can be an incredible way for our community to come together to help organizations, small business, and individuals in time of need. CECOSESOLA is a huge cooperative network in Venezuela. They operate three food markets, serving thousands of people every weekend, as well as a large health center, funeral home service, health clinics, small farms, and food production co-ops across the country. Increasing political and economic instability in Venezuela presents challenges to our friends to continue the life-changing work they do in the community. Your donation today goes directly to CECOSESOLA to offer emergency support to their workers and cooperatives. Here is a film that the Olympia Food Co-op staff produced after our first exchange with CECOSESOLA in 2012. Community Sustaining Fund is an Olympia non-profit organization offering seed and sustaining funds for various local organizations. The grant cycle is open twice a year. Here is an article in the Table, Spring 2016 issue, written by an Olympia Food Co-op Board Member. Thompson/Chaplin Family – in response to an incident on May 21, 2015 when Andre Thompson and Bryson Chaplin were shot by an Olympia Police Officer. Here is an article from our staff in the Table magazine (pdf) page 12. Here are a few more links related to this round up… Black Lives Matter… Showing Up for Racial Justice … Project Implicit (an online test to examine your own biases).